World poverty is at an all time high, can LED lighting provide the means to increase crop yield and growing time? LED lighting is mainly viewed as the future of commercial and residential lighting, but this shows that lighting technology can be used for so much more. Two hours from shipment to retail shelf. Japanese firm Innovatus has established a supply chain that would be the envy almost any fresh produce grower or distributor. The quality and control systems in place at the company’s Fuji Farm are so advanced that its range of lettuces can be on display in Tokyo supermarkets literally hours after being picked. It’s not just the speed of Innovatus’ operation that impresses. 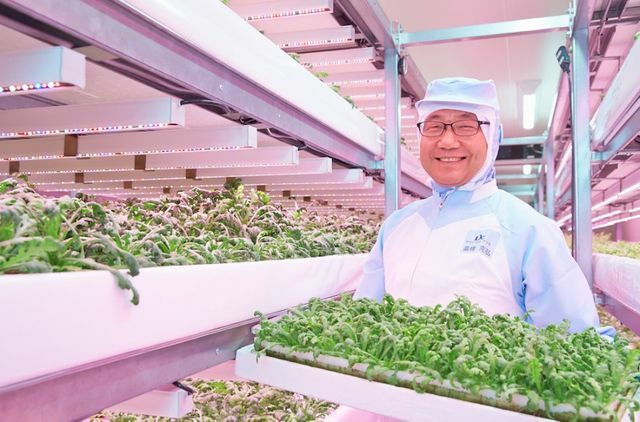 After a 14-month trial, Fuji Farm, one of the biggest vertical farms in the world, now produces 12,000 heads of lettuce per day across a total floor area of 1,851m2. The indoor farm uses Philips Lighting’s horticultural LED lighting technology to produce five varieties of lettuces – mainly frilled lettuce, green leaf and romaine.